Tim Powell came to Carlton via a trade with Richmond for Pick 28, a pick that would deliver Jamie Tape to Richmond (and then on to Collingwood for Aaron James). Powell was originally from Berrigan, NSW, he later honed his skills as a footballer at Assumption College in Kilmore. 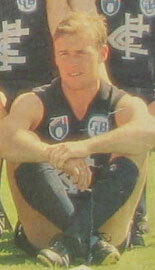 Powell had played 64 games and booted 40 goals for the Tigers in his stint from 1988 to 1992. Powell was a useful enough player - a right footed wingman with a bit of toe. He would play a couple of cracker games for the Blues with 21 possessions off the wing, or half forward flank, in Round 14 (v West Coast) and 15 (v Brisbane) in 1993, and raise hopes throughout Princes Park with 10 goals in 9 games for the year, but at other times he struggled to find the ball. It was the West Coast game in particular that had raised the hopes - he seemed to be able to find space on the outer wing and from memory kicked 2 goals as well. Powell looked dangerous at the time. Powell kicked two crucial goals in the Blues thrilling win over the Bombers in the 1993 Qualifying Final which included a lovely snap at the City end. He played in the Blues losing Grand Final to Essendon in 1993. Powell was runner-up in the 1993 Gardiner Medal whilst playing for the Blues. Powell would play a further 2 games in 1994, before finishing up with 11 games at the end of that season. Powell wore the #22 guernsey. Powell took over the coaching reigns of VAFA club Monash Blues midway through the 2001 season, he was reappointed for the 2002 season. Contributors to this page: molsey , Bombasheldon , tmd1 , true_blue24 , Jarusa , WillowBlue , steve and admin . Page last modified on Friday 22 of June, 2018 18:58:35 AEST by molsey.